The HWg-STE web thermometer is configured using a built-in web server. If the temperature (humidity) exceeds a specified threshold, an e-mail alert is sent. The speciality of the device is free windows software HWg-PDMSfor graphical overview and MS Excel export included. 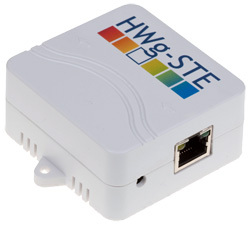 HWg-STE includes a built-in Web server, the unit is fully functional without the need for any additional software. The set contains HWg-STE, Windows software, AC power adapter and temperature probe. The device supports DHCP. The installation is simple. Changes in temperature point to a failure of an A/C unit. Saves heating and air-conditioning costs. Oversees optimal storage conditions. With application software, HACCP reports can be created.